People often times wonder are there guidelines that journalists live by? Yes there is, in fact a society of professional journalist created a site, a code of ethics all journalists should follow in order to be successful in the world. There are four concepts, they are "Seek the truth and report it," "minimize harm," "act independently," and "be accountable and transparent." These codes of ethics is meant to influence journalists and the way they should report their story especially to the public. What motivates journalists or what should at least motivate journalist is their obligation to the people. According to Radio Television Digital News Association journalism places main priority should be the public's interest rather than "commercial, political and personal interests." RTDNA also stated that journalism doesn't tell people what to feel or what to believe, they help readers or listeners make informed decisions by themselves. 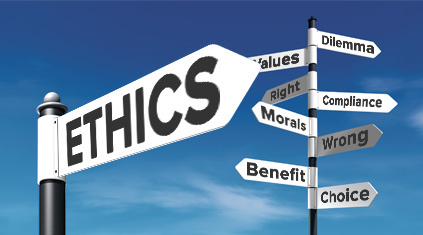 Although there are a range of answers of what guidelines or code of ethics journalists should follow when reporting a story their goal is the same to get accurate information out to the public. RTDNA codes of ethics is similar to those of SPJ the first code of ethic is "truth and accuracy above all" several points that were brought up are when creating a story know that there are two sides to every story while some parts may not fit or work into the account it is our duty as journalists to be clear about what is being omitted and what is being included. Another interesting key point is that facts change overtime. It is incredibly important to inform the audience with any new updates so that those who are tuning in have accurate data. The next code of ethics is "independence and transparency" one point that stood out the most and will probably stand out to readers is this ethical journalism is owning errors that are made if one is made and fixing it promptly, because the main goal as a journalist regardless what field you are in is to report the truth to the audience. The last code of ethics is a little different than SPJs which is "accountability for consequences" meaning that as journalists when you put stories you accept the responsibility, "articulates" its reasons and its processes to scrutiny. A great point RTDNA brings up is just because you as a journalist have the right to publish or share information doesn't mean it is right to do so, but as a journalist 's job is to seek the truth and report despite how hard or how sensitive the story may be because we would be doing a disservice to the audience. Being a journalist isn't an easy job, you are told to do certain things and to be a certain way but it is hard to not get attached to the story that you are connected to at the time. It is hard to not have an opinion, or a viewpoint despite all that weighed against you you do your job to provide great information to those who needs to hear it.